As part of the meat free week here is my contribution to the “meat free recipe” community. Meat Free Week, an annual campaign about making the choice to eat less meat, care more and feel good. This vegetarian dish is packed full of great tastes – grilled aubergine and tomatoes in a blend of spices. 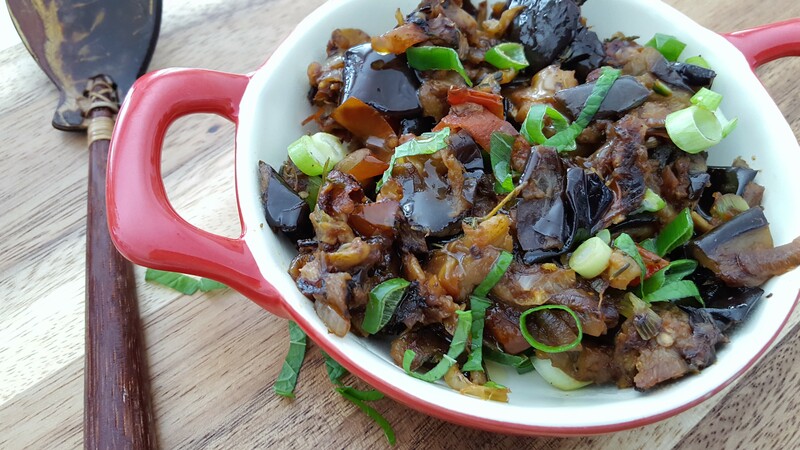 The smell of grilled aubergine reminds me of cooking outside on the open fire, the smoky smell wafting away – it can only be the sweet smell o that tickles your taste buds. In my recipe I have partly fried and partly grilled the aubergine and tomatoes but you could grill the aubergine slices till nicely brown and tender under a grill in the oven or even better on open fire. 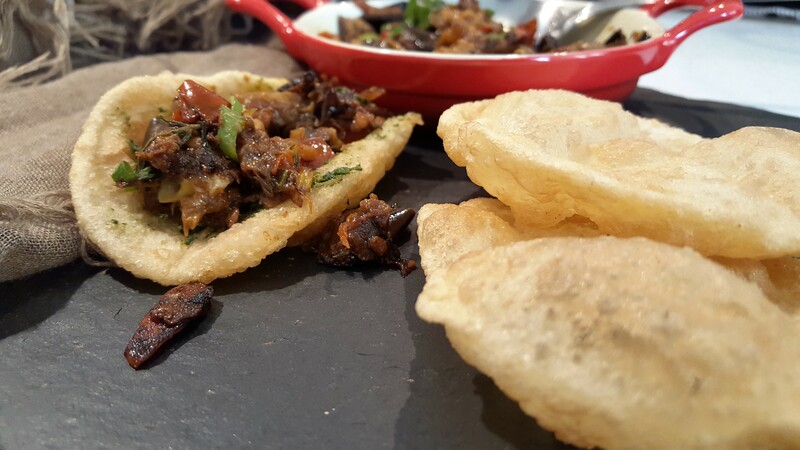 Either way, this is a truly delicious combination of textures and flavours. 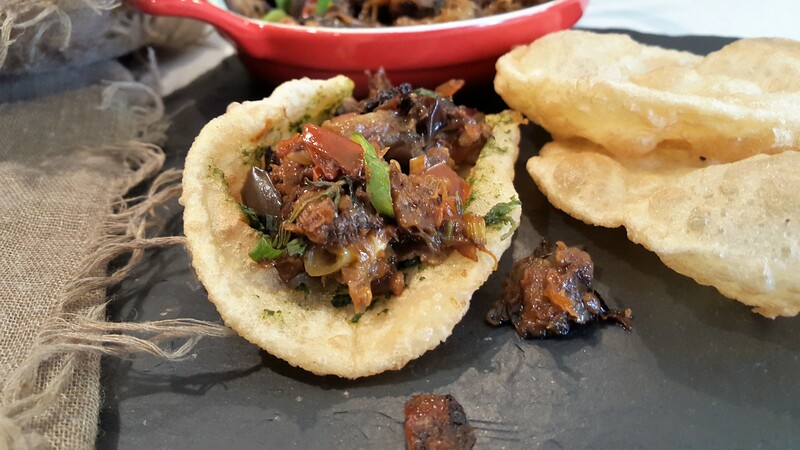 A dish you can eat both warm and cold accompanied with puri, pharata or plain boiled rice with the temptation of eating with your fingers. 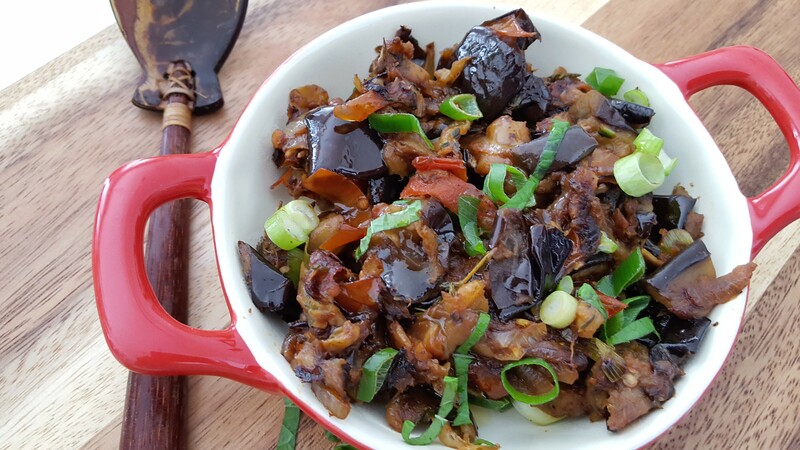 In a large skillet add 1Tbs vegetable oil, once hot start by sealing and frying the aubergine. Season with a little salt, cook until soft moving the pan constantly for an even cooking until the aubergine turns golden brown in colour – almost looking like grilled aubergine. Remove from heat and set aside. In the same skillet add a drizzle of oil, fry the onion, garlic followed by the chopped tomato. Season with the cumin, tandoori powder (if using), chilli powder, curry leaves and salt to taste. Allow to cook slowly until reduced and again almost grilling, if required drizzle a little oil. At this stage add the grilled aubergine to the tomato mixture, and leave all the vegetables and spices to cook on a low heat. Cook for another 10-15 minutess, turn the heat off add the ghee and stir gently. Garnish with chopped fresh coriander leaves. Serve either warm or as a cold side dish.